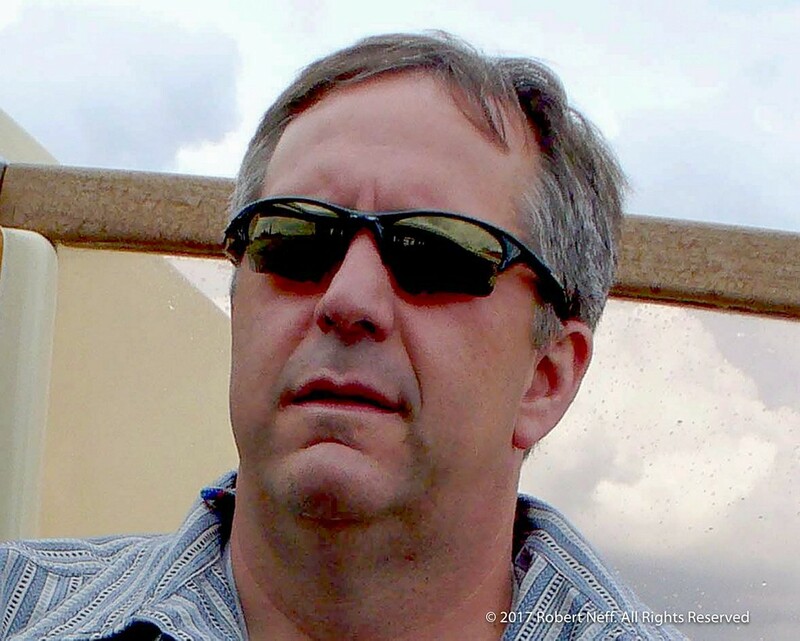 BAY POST INTERNET: Why Isn't St. Petersburg Enforcing the Noise Ordinance ? Why Isn't St. Petersburg Enforcing the Noise Ordinance ? Why haven't the police cited a business or residence? From 2009-2016 there were 27,638 calls to police for noise and no citations were issued for businesses or residences. While I have no information on the previous administration's policy, Mayor Kriseman and Police Chief Holloway's Police Officers have not enforced the City Noise Ordinance since each person assumed the office. For the past year, I have conducted an investigation, paid for Public Records requests, and donated both my resources and time. When you start working with new data and processes, you have to learn how Police conduct business, become familiar with the data, and the information collected. After much research, I determined that I needed to create one data repository. This required me to reverse engineer the data and content from disparate data sources. Based upon the data, my conclusion is simple. The City of St. Petersburg has the worst noise ordinance in the nation because no business or residence has been cited for repeated offenses. The responding officers and supervisor did not observe a violation and therefore the resort was not cited…. The sergeant will respond and take appropriate action if a violation has occurred… If here is no violation observed, the Flamingo will not be cited. Even though the police officers have stood with others and me, and heard both the music and the bass thumping, the level of noise did not rise to the level for them to cite the business. Observing a noise violation is dependent upon the responding Officer's hearing. Not every responding officer hears it. Some responding officers said they have hearing loss from firing weapons at the gun range. The police force is not trained on how low frequency waves can impact a home, nor do they have the equipment to measure it. I can hear bass thumping and feel bass thumping through the walls. I have had guests here who asked what was that thumping? There was an officer at the ground level of the condo, who and could not hear the thumping, yet, I could several floors up. The noise ordinance is subjective. Do I need to ask for an officer whose hears can hear and feel the thumping? Many of the police who responded could not hear the bass thumping nor feel it. None of them have felt the bass thumping through the walls. However, one officer who responded to another resident stated he could not hear the thumping until he walked inside the condo. Then he felt the walls vibrating. Even though the police officers have stood with others and me, and heard both the music and the bass thumping, the level of noise did not rise to the level for them to cite the business. 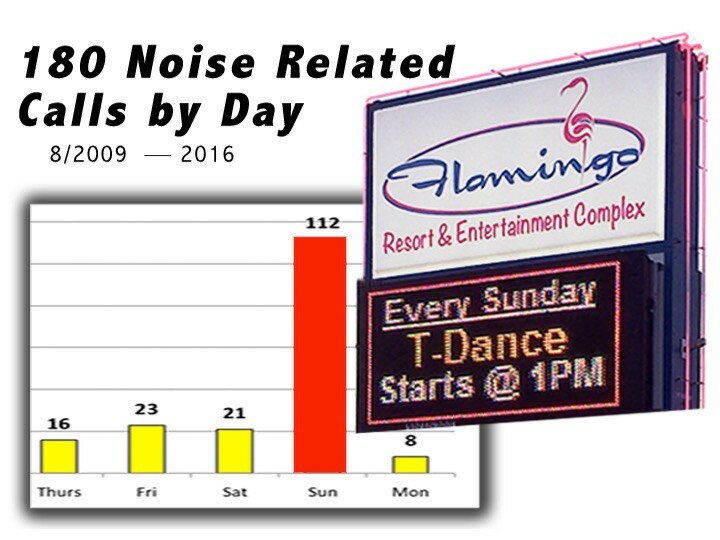 So, the 180 times residents were wrong when they called Police Dispatch to complain to about the noise at the Flamingo Resort? How about the 27,638 calls residents made from 2009-2016? Were they wrong? Was this woman wrong to call because her walls were vibrating? The City of St. Petersburg promotes itself as a progressive city. 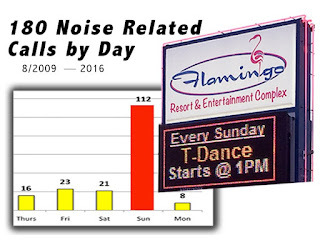 With the noise issue, Mayor Kriseman and City Council must decide whether or not they want to lead the nation and protect residents from repeat noise offenders or continue to protect businesses. Considering my seniors at the condo and I can hear the noise, Council Member Kornell's comment deeply concerned us. Sunday, a day of rest and relaxation, is the worst day of the week for noise calls. However, there were many times we did not call because we were frustrated that the City Mayor, Council and Police Chief are not "being taken seriously". Unfortunately, the negative City, Council and police sentiment is a by-product of Mayor Kriseman and Police Chief Holloway's lack of enforcement. Public input is being sought to revise the Noise Ordinance, even though the noise ordinance was revised in 2016. There are a series of three public meetings to update the noise ordinance. The 2nd Public hearing was held on March 29, 2017. City residents, who are bothered by the noise, mobilized and attended the meeting. When the city was asked how many citations there had been, the City did not have an answer. I responded, ZERO for businesses and residences from 2009-2016. Mayor Kriseman and Police Chief have not enforced the noise ordinance and residents are upset. If the resident's passion at this meeting has any bearing on the revision process, Mayor Kriseman and City Council Members are heading for rough seas. You may express your concerns and thoughts by emailing the Mayor at mayor@stpete.org and your council member, council@stpete.org. Maybe since all his bitching and complaining got the Maximo Seafood Shack shutdown much earlier than originally planned, Robert thinks if he does the same thing again it will get the Flamingo shut down? He needs another hobby other than complaining about the Flamingo. Well maybe the Flamingo needs to respect the community it is located at. He needs to keep on complaining until somebody shuts up the loud inconsiderate business I love the food but cant stand how loud it is there.. It is deafening. Be a good neighbor and tone it done. You might make more business. We don't want the flamingo shut down quite not just to tone it down. I don't know what the problem with toning it down. It is a nice place and if the flamingo was neighborly friendly you just might have a fantastic asset instead of a hangnail. I am not anonymous I am Phyllis and hope some compromise can take place. It is the RIGHT thing to do.